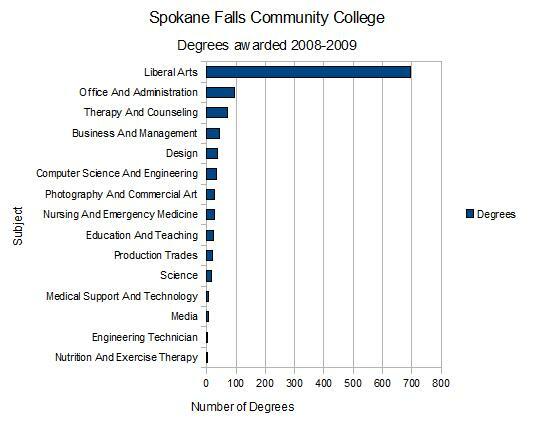 Below are charts of the college degrees awarded in Spokane. 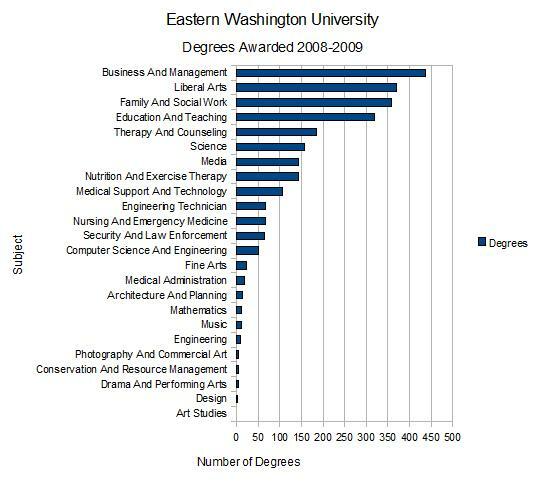 Of the 50 degrees granted in Computer Science and Engineering in 2008, 49 were Bachelor degrees and 1 was a Masters degree. 9 undergraduate degrees in Electrical Engineering were granted. 118 Bachelor degrees were granted in the “Biological and biomedical” category plus 3 Masters degrees. (Source). Update: 2010 degrees – 10 MS in Biology, 7 MS in computer science. At the undergraduate level, 93 in biology, 26 in general chemistry, 38 in computer/information science and 2 in “computer engineering tech”, 17 in electrical and comm engineering. I did not get the data for Washington State University-Spokane, which provides some Bachelors programs and several Masters programs. The data I could get are for all of WSU: Pullman, Tri-cities, Vancouver and Spokane, not the individual campuses. I also did not get data for Whitworth University. Can you spot the strong base of research and academic resources in information technology and telecommunications? You may need to squint. Bioscience is said to be the next big thing in Spokane – squint again! 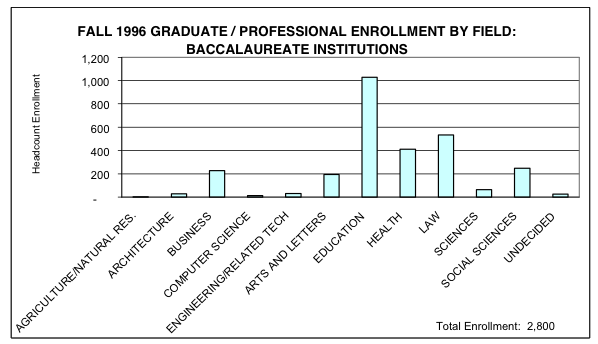 Note that a grand total of just 4 graduate degrees in technical subjects were granted, with one in computer science and 3 in biological science. 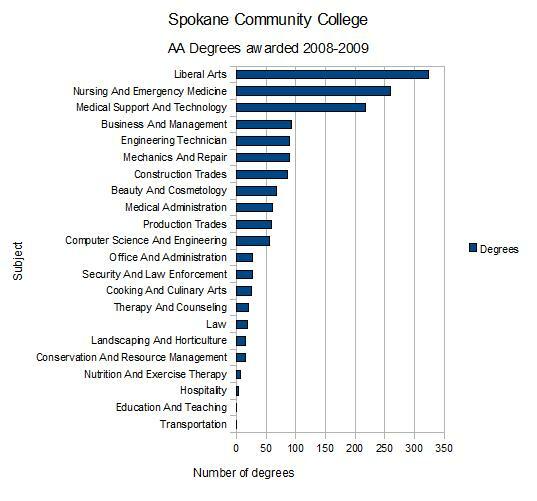 Virtually all graduate degrees granted in the Spokane area are in Education, Business (M.B.A.), Nursing (M.S.N.) or Law (J.D.). Here’s the distribution of all degrees in 1996 – the major change between 1996 and today is the much larger business major graduates. Why is having graduate degree programs important? A graduate degree is a major undertaking and provides advanced training in the most recent developments in the field, passing along knowledge that is required for practitioners to be able to extend their field of study. Because a graduate degree is a major undertaking, such programs appeal to those with ambition (and also the financial ability and opportunity) to purse graduate degrees. Many of these students go on to take on leadership roles in their organizations. Without a strong graduate education program in the innovation fields, the Spokane area loses its ability to innovate and grow 21st century industry. And lacking graduate opportunities, ambitious recent college grads will not stay here – particularly when we look today at the large percentage continuing on to graduate educations. For example, at the University of California, Berkeley, 60% of year 2010 graduates in 4 year engineering programs have gone on to graduate school. 40% to 50% graduate program pursuit is common at many universities today, particularly in a “buyers” market that favors employers versus labor. Until recently, graduate programs in several fields of engineering, including robotics, were offered by Spokane area universities. As of 2010, the only graduate degrees in science are the M.S. in computer science at EWU and the M.S. in Biology at EWU. 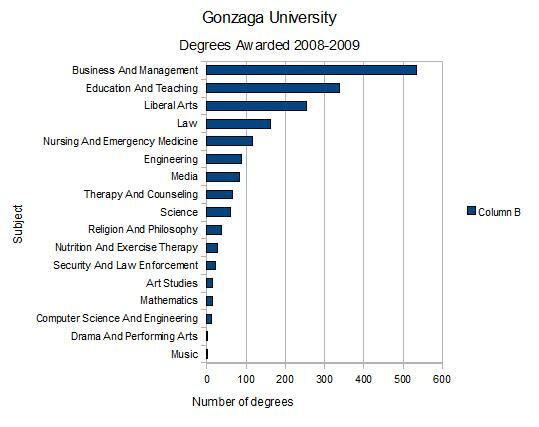 Gonzaga and WSU-Spokane ended their graduate degrees in engineering and computer science. WSU-Spokane offers an M.S. in exercise science, which is intended, as best I can tell, primarily as a pathway into health care delivery services, probably physical rehabilitation and therapy. These programs were ended because both the enrollment had declined as cutting edge industry left Spokane, and because of the State’s mandate to support primarily those field identified as active “industry clusters” for the Spokane region. Greater Spokane, Inc, is the local Chamber of Commerce. Their job is to market the local area to prospective business start ups, businesses that are expanding or relocating to Spokane. GSI hasa list of Top High Tech Companies in Spokane, which is duplicated, below. When this was originally posted, from the GSI web site, the list had 50 companies on it, even though many were out of business, had moved, or were not even in Spokane. As of October 2011, GSI has updated the list. The original list of 50 companies has been cut down to just 20. 3 of those 20 are advertising firms, although they do use tech in online advertising and marketing, and 2 are system integrators. These are not “high tech” in a Seattle or a Silicon Valley sense. In case you were wondering. 15 is quite a decline from the long claimed (and not updated in almost a decade) of more than 150 high tech companies in Spokane. The list is unfortunately out of date. About 25% of the companies on the list are no longer in business, not really tech firms, or not actually in the area. With its strong base of research and academic resources, Spokane is concentrated on becoming a burgeoning center for information technology and telecommunications. Note: Empire Health Services was purchased by for-profit Community Health Systems and is now known as Community Health Systems. 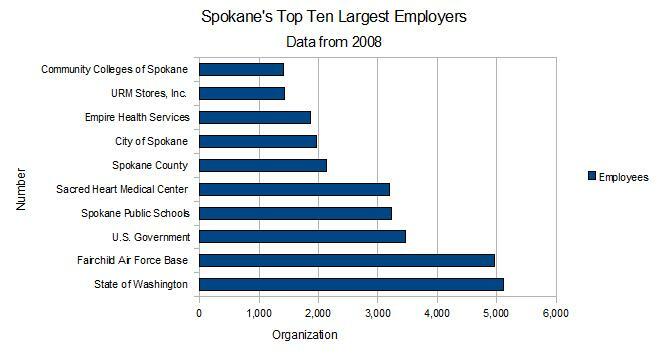 Data source: US Chamber of Commerce, from Market Fact Book 2008, Spokane Journal of Business. Hmmm … notice a pattern here? 7 of the top 10 are basically the government, 2 are health services where an estimated 60% of their revenue comes from the government, and 1 is a retail grocery outlet. This supports my thesis that Spokane is a two-class society – those that work in government, health care and education and earn salaries comparable to Seattle – and everyone else who earns much less. There is anecdotal evidence that many of those in the government class (but not all) are unaware of the challenges faced by those outside the government class. 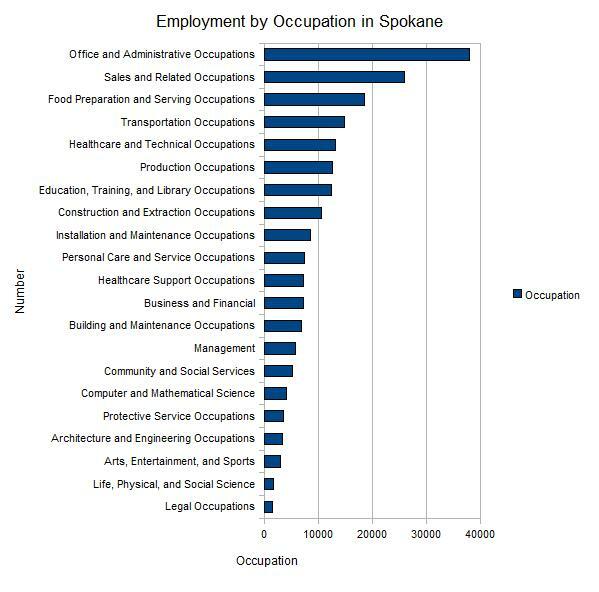 According to the State of Washington “Current Employment Situation” report (available here) for the month of June 2010, there were 206,000 non-farm jobs in the Spokane MSA (which is Spokane County). Of those, 38,800 were in the “Education and Health Services” category and 36,700 were in the “Government” category (Federal, State and local). Therefore, 75,500 jobs are in the Government/Health Services/Education categories. Spokane is said to have a “diversified” economic base and this is promoted as a feature, unlike, I guess, Seattle, which has concentrations in aerospace, software, high-tech, insurance, manufacturing and so on. 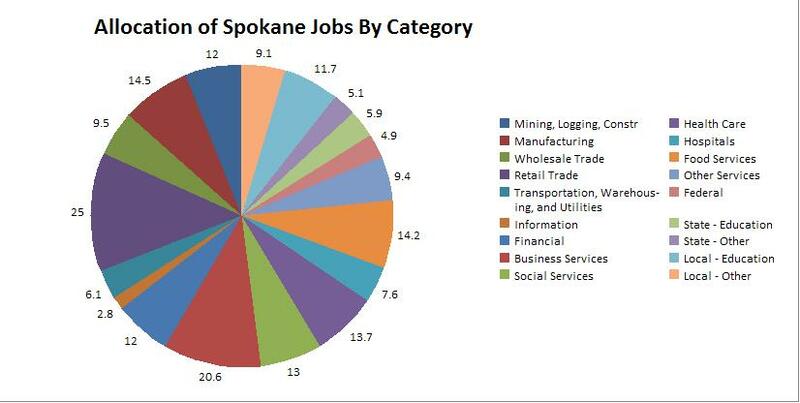 Look at the following chart – can you spot the “high tech hot spot” in Spokane? All numbers are in thousands – e.g. 2.8 is 2,800. I can’t spot it either. Does Spokane have a “vibrant, entrepreneurial” culture? Which place is going to be more vibrant, entrepreneurial, and have a more secure future? via MetroSpokane: Best Cities for Relocating Families – Spokane hits top 10. Note – the MetroSpokane blog shut down in 2008. He also suggests that rural area economic growth is dependent on fostering a “creative class” and that remote cities – like Spokane – can no longer depend on satellite manufacturing facilities of larger companies. What is needed is action to spur a creative and entrepreneurial class since manufacturing and tech sectors, as they existed, are gone for good. Going back to the MetroSpokane post, the “hint” provided is that Spokane has lost its young, vibrant vitality as ambitious young people move to the hip, forward looking, coastal metro cities. The corollary is that a quiet, low change environment may be desired by retirees and those nearing retirement. Question: Does Spokane have vibrant, entrepreneurial creative class like say, Seattle or San Francisco? Update: More on the culture issue in this newer post. A large portion of students who graduate from high school and go on to college end up having to take “remedial” classes in math or writing/grammar. This problem occurs nationwide. According to this web site, Laurie Rogers (2010) says that 87% of students graduating from Spokane School District high schools who go on to attend Spokane Community College or Spokane Falls Community College are required to take remedial math courses upon entry (I’ve verified similar numbers from other sources). About half of those then dropped out or failed the remedial class. For most students, elementary algebra – or lower – was were they were placed based on the standard mathematics placement exam given to entering students. The linked web site appears to be about the school district’s process of choosing a new mathematics curriculum.